The Cumbrian Tourist Board will hate me, but I don’t really do the Lakes. Every time we head that way it rains. Today (30 September 2013) we’d spent the morning in Carlisle, visited Wreay about lunchtime, had a leisurely tea beside the railway, and found very narrow roads to explore. We came down by Ullswater, then followed the B5320 to the south of Penrith. Entering the hamlet of Barton – I grew up in Barton, Cambridgeshire – we followed the sign to the church … and what a church! 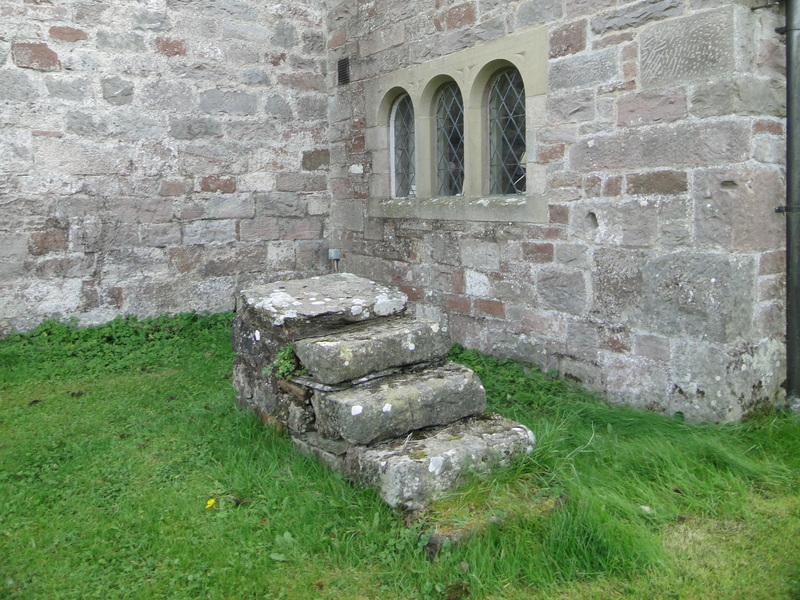 Part of a benefice with Pooley Bridge et al. 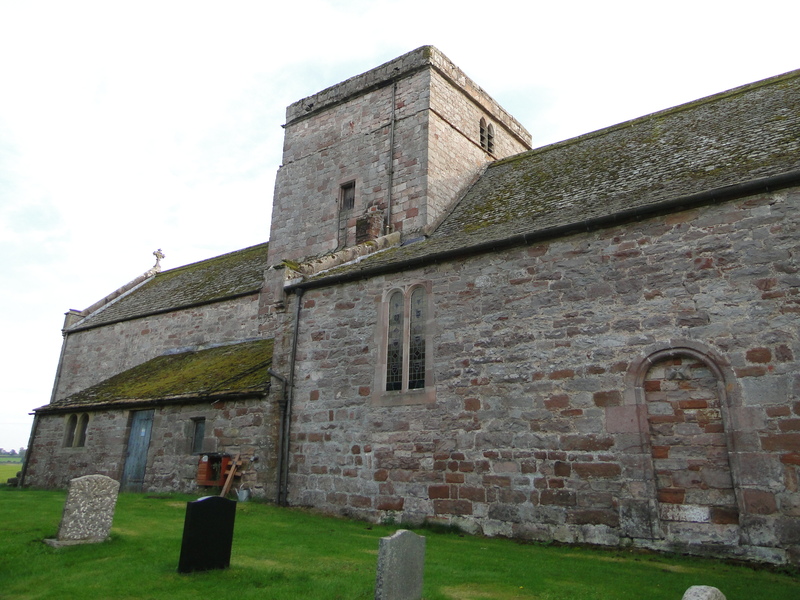 NY488263, Grade 1 listed building, with one of the best, most thorough guidebooks I have found on my travels. My photos are not brilliant – it was getting a bit late in the day – but they will give a flavour. When I’ve done Northumberland, perhaps I’ll do Cumbria (if the Second Coming doesn’t come first and, the speed I’m going, it may well do!). 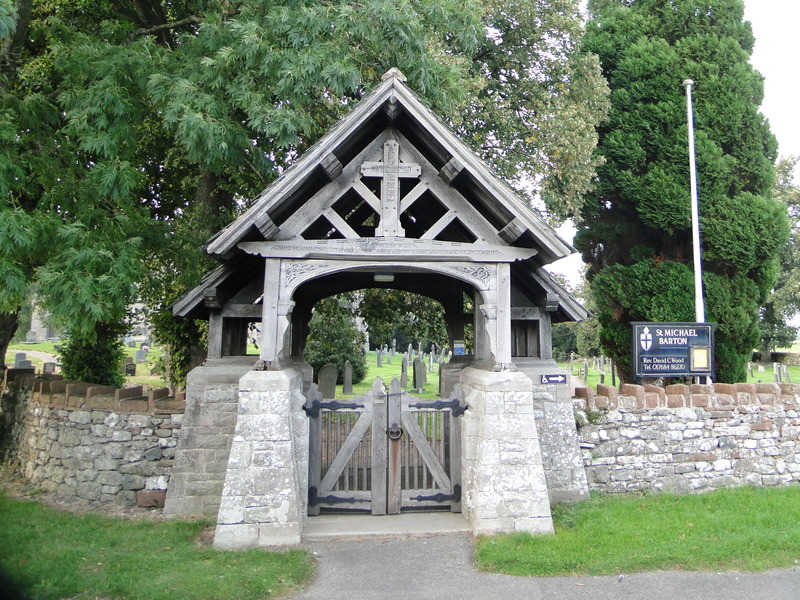 The Lych Gate is a War Memorial and a separate booklet tells its story. Twelve Barton men are commemorated on this memorial. It cost £380, was made by Mr Bardgett, joiner of Pooley Bridge. (Our local funeral director in Ponteland is John Bardgett and Sons – I must ask if they have a Cumbrian connection. 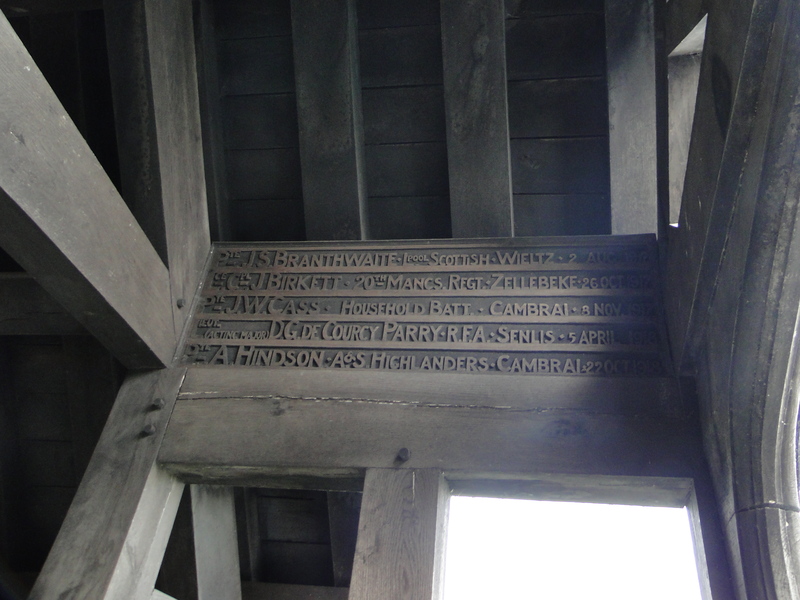 “Joiner and undertaker” so often go together – we had one in Suffolk which practised both trades). 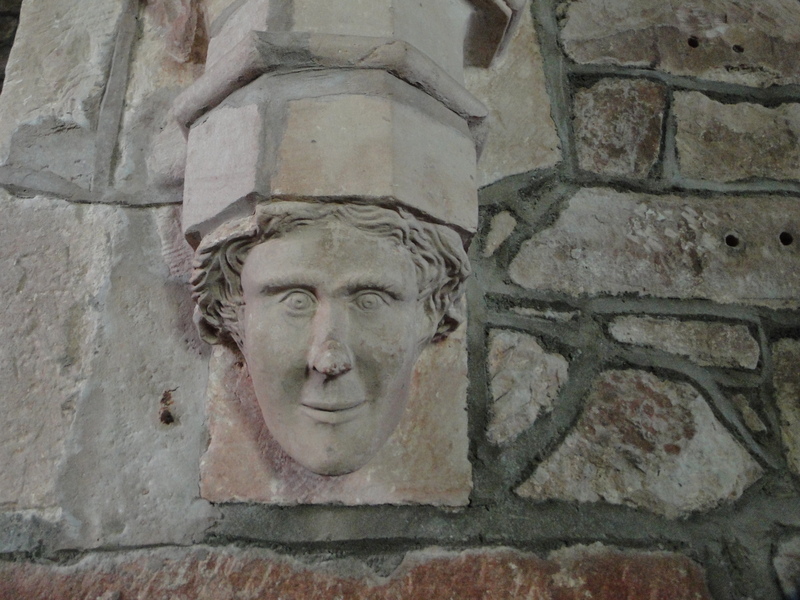 The wood carving was by Fred Dixon, the stonework by Mr Abbott. It was dedicated by Bishop Williams of Carlisle on 21 November 1920 – it makes me wonder how many war memorials the good bishop must have dedicated in his time. The first hymn was “Fight the good fight” and the text for his sermon was 2 Corinthians 13.13 “all the saints salute you”. According to the booklet “He mentioned certain troublesome matters: the plight of jobless ex-soldiers, the grief of families, the state of the country and its economy, the need to find a means of securing international peace. But he thought the parish’s choice of memorial pointed to ‘that eternal and invisible world of spirit’. … He stressed the truth of the afterlife but took issue with spiritualism … an immensely popular activity in those grief stricken years. … There was no need to bring back the dead, for one day, all would be re-united: their loved ones were only hidden ‘for a while’ before they would all meet in God’s kingdom.” I’m quoting him in full, because, with the anniversary of World War 1 coming up, I am going to have to think of things to say. What a wonderful, chunky church. The graveyard is circular, so could well be ancient. 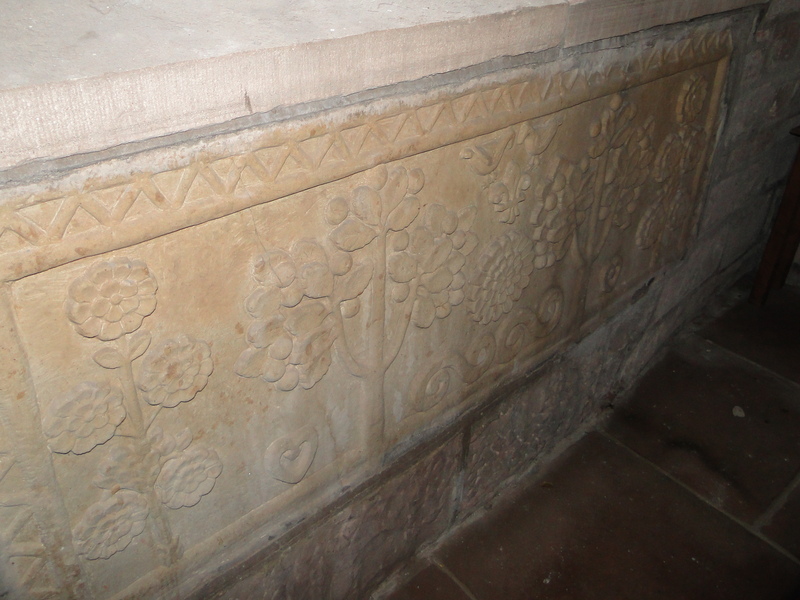 The parish was huge, and the basic fabric of the church is Norman. You can imagine the women and children huddling in the tower as the Scots swept southwards. You enter the Nave. 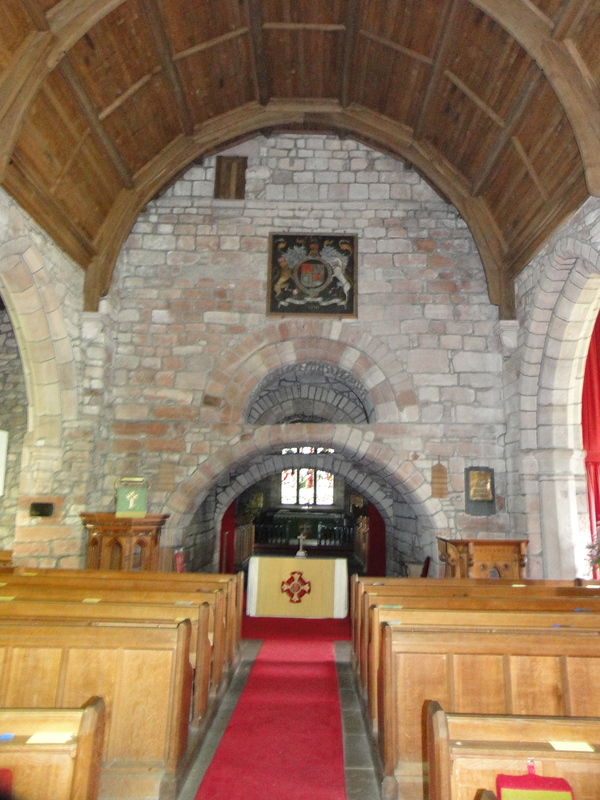 Definitely Norman, built c 1150 by the de Lancastre family of the Barony of Kendal. The guidebook makes the point that the Norman Conquest only reached Westmorland in 1092. 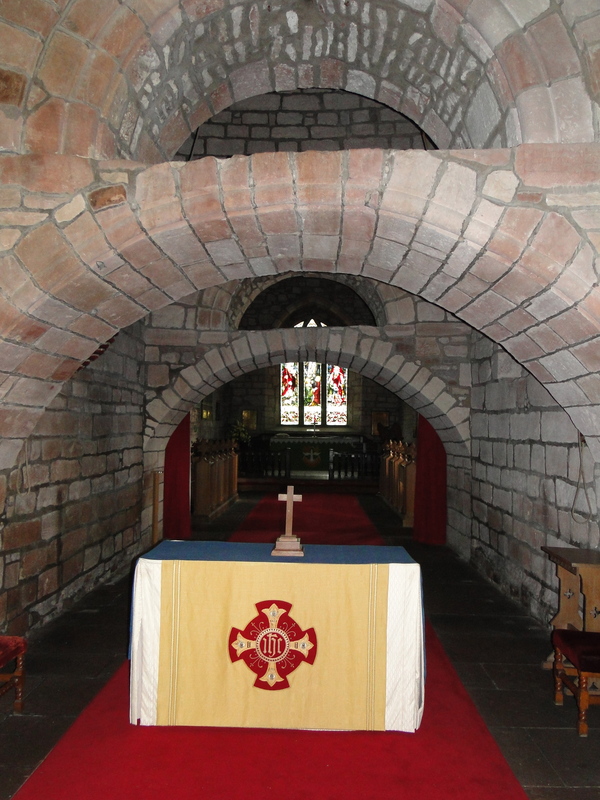 The south aisle, c 1250, leads to the south chapel, added in 1300 as a Chantry Chapel (for the singing of mass). 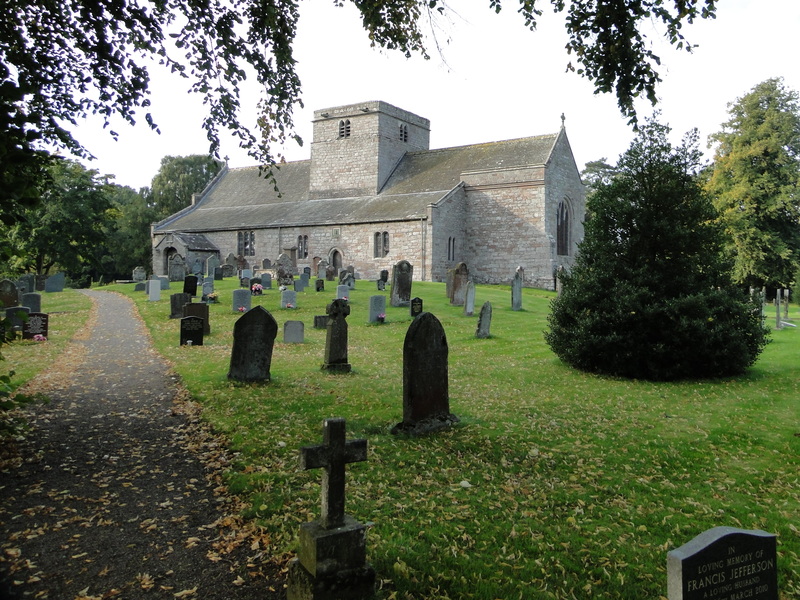 The north aisle is 1280 – the head may represent Edward I whose reign (1272-1307) began shortly before the aisle was built. The guidebook says “The eyebrows certainly match those in his portrait in Westminster Abbey” – I’ll take their word for it. 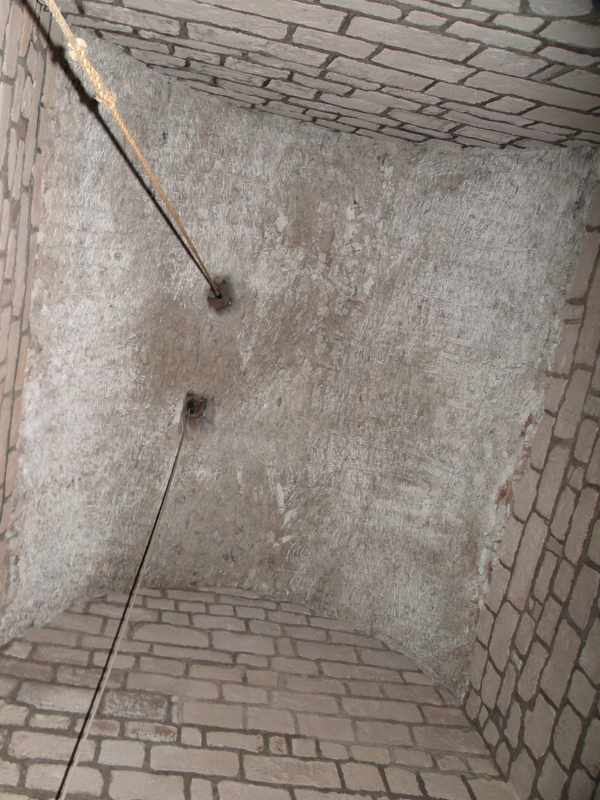 The royal arms are those of George II, and the doorway above them was the only access into the bell chamber. 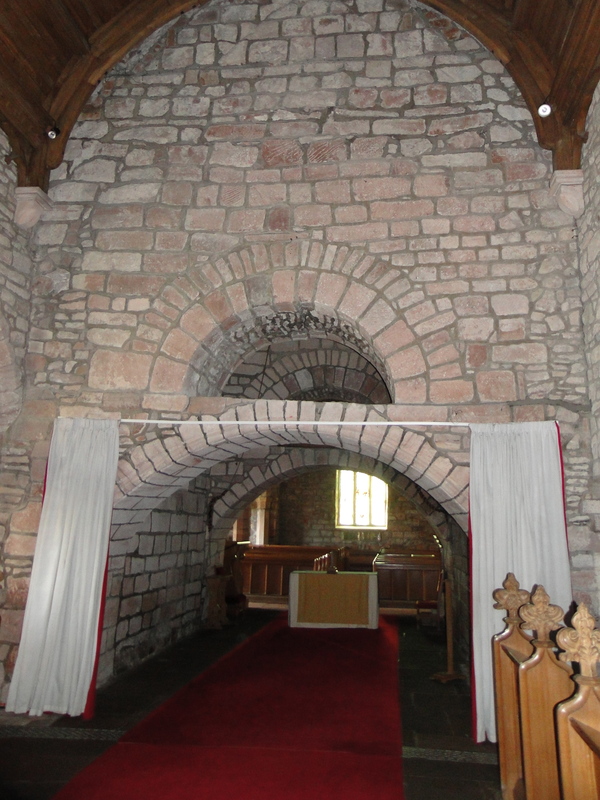 The bottom arch was added around 1330 to take some (more) of the weight of the tower. Walking beside the altar and looking up is an experience, and when you come into the chancel you can look back into the nave (I like the hidden curtain rail). Too dark for much else. 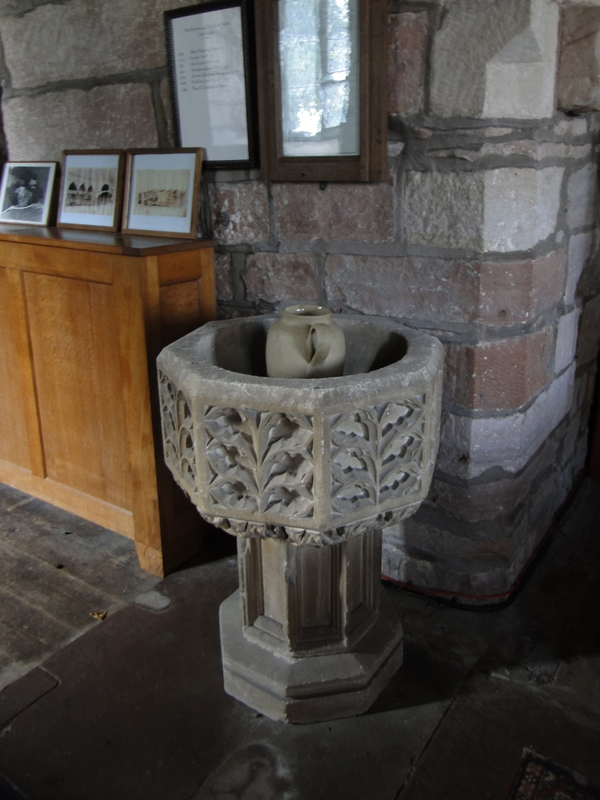 This slab is late C16, the font is modern. 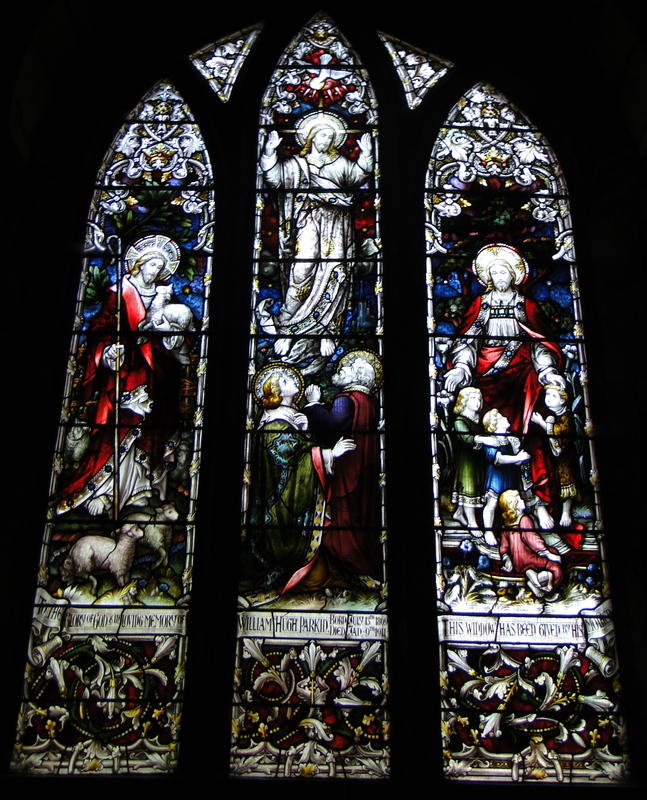 Glass is by Walter Tower, nephew and partner of Kempe. I will have to come back and do this church properly. For now I will mount my horse and ride into the darkness. Night, night.